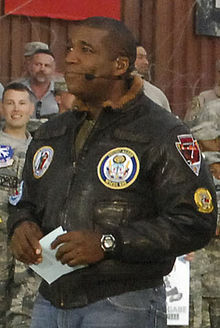 Menefee at Bagram Airfield in November 2009. Menefee attended Coe College in Cedar Rapids, Iowa (class of 1987). At Coe, he was a member of the Sigma Nu fraternity and inducted into the Sigma Nu Hall of Fame in 2016. He gave the commencement speech at Coe College in 2010 and was awarded an honorary doctorate in Journalism. Menefee resides in Los Angeles, California. Menefee called the NFL preseason for the Jaguars TV network from 2005-2007. He currently does NFL preseason television play-by-play for the Seattle Seahawks. Prior to joining Fox Sports full-time, he was a sports reporter for MSG Network's SportsDesk show. Prior to that, he was the sports anchor for WNYW, New York City's Fox flagship station. He also appeared on-air on WTLV in Jacksonville, Florida. He began calling NFL games on Fox in the late 1990s. He also hosted a radio show on the popular Dallas, Texas sports radio station KTCK ("The Ticket"). He was also the sports anchor for Dallas-Fort Worth's then-independent station and now CBS affiliate KTVT where he refused to wear socks during the newscast. Menefee has provided play-by-play for Fox's NFL Europe and Fox NFL coverage in the spring and summer months. On May 24, 2008, Menefee made an appearance on MLB on Fox. He held play-by-play duties alongside José Mota during a game between the Los Angeles Angels and the Chicago White Sox. On May 22, 2010, Menefee hosted Fox's coverage of the 2010 UEFA Champions League Final between FC Internazionale Milano and FC Bayern Munich in the first broadcast of that tournament's final on over-the-air broadcast television in the United States. On November 12, 2011, Menefee became the host of the UFC on Fox with Randy Couture and Jon Jones. Menefee also provided ringside commentary for Top Rank's coverage of the Pacquiao-Hatton fight. He was also the play-by-play announcer for ShoBox: The New Generation. On January 7, 2012, Menefee announced he was leaving ShoBox. ^ Communications, Seahawks. "Seahawks at Chiefs Notes". Seahawks.com. Retrieved May 17, 2011. ^ Communications, Seahawks. "Seahawks vs. Broncos Notes". Seahawks.com. Retrieved May 17, 2011. ^ Farnsworth, Clare. "An evaluation situation". Seahawks.com. Retrieved May 17, 2011. ^ "Fox Acquires Bruce Arena and Curt Menefee For Champions League Final | Independent voice for EPL soccer fans since 2005 – EPL Talk | Page 18941". Epltalk.com. April 30, 2010. Retrieved November 8, 2012. ^ "It's Showtime for Curt Menefee - ESPN". Espn.go.com. Retrieved May 17, 2011. ^ "Boxing Buzz". Fightnews.com. January 7, 2012. Archived from the original on April 16, 2012. Retrieved November 8, 2012.